August. It’s the month for heat and vacation before the school year starts. Easy, simple and light meals are the way to go. So the theme of August dining for Wilmette at the Lake is chill or grill. Here are recipes for both. Chilling and Grilling. Enjoy! Serrano Chili (thin slices for garnish) Depending on your heat tolerance you may want to add more. Remove the top of the tomato. Scoop out the insides and set aside. Salt and pepper the insides and enjoy as a snack. In a bowl, lightly mash the avocado with a fork and add the spinach and basil. Drizzle with lemon juice to taste (about a half a lemon), add salt and pepper. 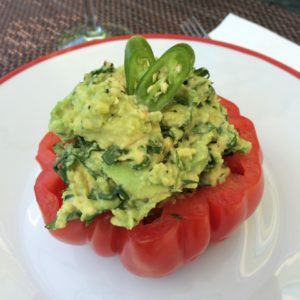 Stuff the avocado mixture into the hollowed tomato. Garnish with 2 slices of Serrano chili. Serve. Can be made ahead and chilled 1-3 hours in advance carefully covered or placed in an air-tight container, being careful not to smash the tomato. Whisk together the clementine, lemon juice and oil in a bowl. Add the radishes and apples slices and toss well. Transfer to a serving bowl. Add salt and pepper to taste. Season the Tuna with salt and pepper. Combine the spinach, basil and lemon zest strands in a small bowl; season with salt and pepper. Add a few drops of olive oil to moisten the gremolata. Set aside gremolata. Heat grill. Lightly oil the Tuna Steak. 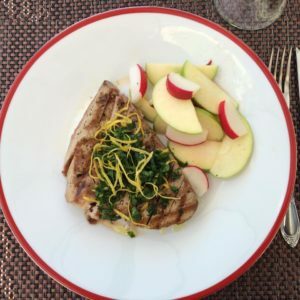 When the Grill is nice and hot, grill the Tuna steak for 2 minutes per side or until desired doneness. Remove the tuna. Spoon some of the gremolata over the Tuna. Slice the Tuna fairly thick, roughly 8 slices or so. Split the Tuna steak onto two plates. Serve with additional gremolata. Plate alongside the Apple Radish Salad.